These pro-quality headphones let you hear it all. Premium 40mm drivers reproduce every musical nuance. Closed-ear design gives a tight bass response, practically eliminates external noise, and snuggles over the ears for hours of comfort. Frequency response is a flat 10Hz to 20kHz so you accurately hear what's being recorded. Gold-plated connectors prevent rust and corrosion, and a UniMatch plug is provided for both 1/4" and 1/8" jacks. Phones fold for easy storage. 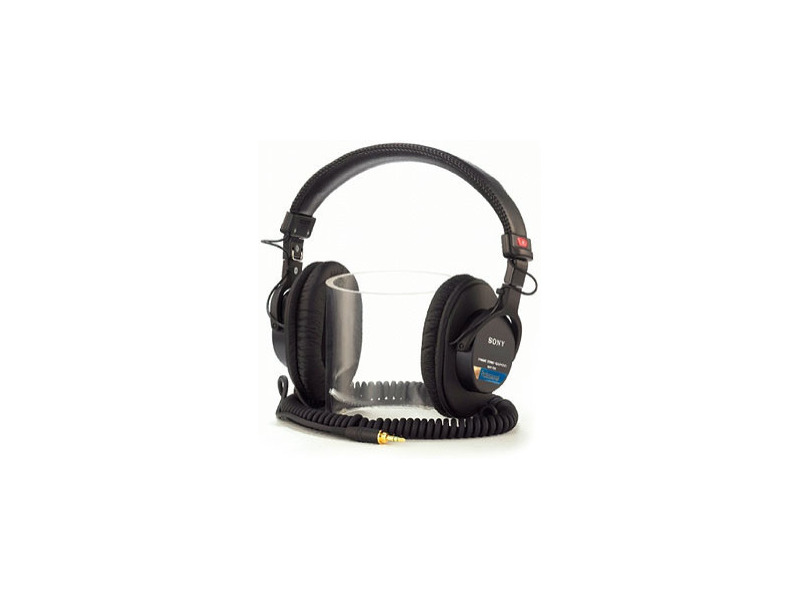 We recommend the MDR-7506 for applications where hearing accuracy is crucial. Includes soft case. I have been using these headphones professionally, as a UK Broadcast TV Sound Recordist for at least ten years, You need consider no other as long as the noise levels you are working in are not enormous, some external sounds are audible to the extent that it will stop you walking backwards into moving traffic! I put these things on and hear whole new dimensions to my music I have never heard before. Songs that I have been listening to years and years and years. I had a pair stolen, and went and bought another. Easy decision. I see them being used in TV shows ALL the time. Just received the mdr7506 as a gift. They will replace my twenty year old mdrV6's. The 7506 have the most accurate sound reproduction in the $80 to $200 range in my opinion. Like one of the other reviewers said use an EQ to get the sound you want. Whether in the studio recording or listening to your fave cd/lp from the comfort of your lounge chair they will not become uncomfortable either. I abused the mdrV6 for twenty years and they STILL work fine. I'll abuse the 7506 and will check back in another twenty to let you know how they're doing. That is if I don't die first! I shopped headphones in the $100 range for quite a while, and after looking at the Sonys & Sennheisers, kept coming back to the MDR-7506 phones. Despite the reviews saying the highs were too bright and the bass was too strong. They're efficient enough to be almost too loud with my Sony MZ-N707 Net MD, and the presence is phenomenal! 10 to 20kHz, dead flat, light & comfortable for long periods, fold up compact in the included bag, and the sound field is so sweet! From the lightest strings and synths, vocals, to full blown jams, it all stays tight and perfectly placed! I can't wait to take these upstairs to my studio and use them for recording and final mixes! You can have a very strong piece of music playing, be right next to them, and barely hear a sound outside, and inside there is no external noise AT ALL. I have to say that I am hearing new things in recordings that I have been listening to, literally, for many years. From Mike Oldfield to Pink Floyd, everything sounds better through these phones! Best money I every spent on an audio piece. Crystaline sound. Maybe the upper octaves are a little too hot. The headband & ear cups are comfortable. I enjoy wearing this pair of "cans". Using my Yamaha, Sony or Pioneer receivers, these headphones can sound a little too bright. Modest EQ trims them down nicely for my tastes. Clean sharp sound in a comfortable package. I've owned Sennheiser phones which fell apart in less than a year. I have Grado SR-80 which have a more bloated sounding mid-range. Yet I enjoy the sound of the Grado SR-80's when plugged directly into a cheap CD player. The Grado's sound more "natural". I see people complaining about these headphones and I don't agree with them. For the price you pay they are fine. Period. Use an EQ and get the sound you want out of them. That is what an EQ is for. I didn't find any distortion and they responded nicely to all EQ frequencies in my studio. I use them as an electric guitar monitor when recording in the studio and found them to be equal to other similarly priced or more expensive products. If you want alot of bass then turn the bass up on the EQ. If you want less highs or mids then kill it on the EQ. Simple. These phones will respond to anything you give them and you can make an excellent sound without distortion. Plus they are LOUD! The better your equiptment is the better these will sound. Don't exspect them to sound good on a junky boom box or crappy stereo becasue they will show you all the distortion and limitations your source equiptment has. If you want a set for that then go buy some at sears for 15 dollars. These are professional grade phones and expect you will use them with pro-grade equiptment. Just about every brand from 5 dollar pairs to 500 dollar pairs over the past 20 years. These headphones are amazing. I purchased them for a friend as a gift and had the chance to use them. I have never heard a lot of the detail in music and now I can hear every last bit. I suggest these headphones for anyone that wants to hear sound in amazing clarity. Flat response (although I consider this to be a strength), Can become uncomfortable over time because of the small cups and tight seal, cord should have been made with 1/4" jack and 1/8" adaptor instead of the other way around considering they are made more for pro applications which normally have 1/4" jacks. I've read a lot of reviews on these headphones complaining about the lack of bass or the flat response. This is what they're supposed to sound like. I bought 4 pair of these for my home recording studio and like studio monitors, a flat response is exactly what you want for mixing and monitoring audio. I don't actually use these for final mixing because they're not flat enough. I use a pair of Event 20/20 professional near field monitors. Normal speakers built for stereo systems have enhanced frequencies to add to the tone of your music. Studio monitors are just the opposite. You want a perfectly flat response so you know exactly what the music sounds like before adding EQ, compression, reverb, and any other effects. For the price, you can't beat these headphones. There are certainly better ones out there for professional use, but not close to this price. As you can tell by the long cord and flatter than normal response, these headphones weren't made for plugging into your MP3 player and going jogging (although you could). They are however, a great deal for any pro or semi-pro applications. Mirror-flat response, very accurate source representation. Closed-design, so mist or dust stays out of element. And feedback risk is low. Availability of parts and support. Durability of cord and plug connection. Quality of constrution and finish. Forgivness of temporary overload, with high sensitivity. I have to agree the pads are a bit fragile-- but the trade off for this is comfort, try wearing a air-filled vinyl pad for more than a 15 minutes- then you won't complain about these again. I've worked in commercial television for about 4 years now on the technical side, in the uplink trucks mostly, and on camera for a short time. I never ever want to be without these beautiful headphones! The response is the flat and clean, with not the slightest hint of coloration or dampenning. What I mean is these beauties will give out exactly what you put in--with excellent sensitivity! They let you hear everything, with so much headroom 10 to 70,000 Hz, and if it sounds sweet in these, you can trust them. If you hear distortion, then it is the equipment or the microphone, not the 7506's. These are flat-out the most accurate, sweet, and honest headphones I've ever use and I will not use anything else.